When one major Apple event approaches, the rumours and speculation quickly follow. iMessage is a iOS and Mac-only service, but recent rumours suggest it could be arriving on Android. OUTSIDE OF ITS September event, Apple is gearing up for one of its biggest events of the year. Starting on Monday 13 June, Apple’s Worldwide Developer Conference (WWDC) will show everything that will be introduced on its software for iPhone, iPad, its Mac range, Apple TV, and Apple Watch. Since the event is geared primarily towards developers, those who create apps and services for Apple’s products, the announcements are going to be software-based. Apple normally reserves product announcements at different times like in March when the iPhone SE was announced. One of the biggest changes expected to be announced is an upgrade to Siri, Apple’s digital voice assistant. Not only is it said to be included with the next version of OS X (which is expected to be renamed to macOS), it will be opened up to third-party developers to help develop apps around it. Currently, Siri only works with Apple’s own services, but this would allow users to carry out actions on apps by asking the assistant. That means, come September, you could be able to order a taxi on Hailo or send a message on WhatsApp just by asking Siri. Other changes to iOS will likely involve Apple Music, which was announced at the same event last year. After criticism for having a less-than-straightforward interface, a revamped version will likely be announced at the event. Another major change that will be announced at the keynote is how it deals with subscriptions in the App Store. Currently, such an option is only limited to certain apps like media but it’s likely any app will be able to offer the same thing. Also, those apps which retain a subscriber for more than a year will see the revenue split go from the traditional 70/30 (30% of revenue goes to Apple) to 85/15, giving developers more reason to try it out. Perhaps the oddest rumour is that iMessage, Apple’s messaging service, is being prepared for a release on Android with MacDailyNews attributing it to “a source familiar with the company’s thinking”. If the rumour is true, then it would join the other three apps Apple has on Android: Beats Pill+, Apple Music and Move to iOS, a way to transfer data from your Android device to a new iPhone or iPad. Email “Could Apple's iMessage be making its way to Android?”. 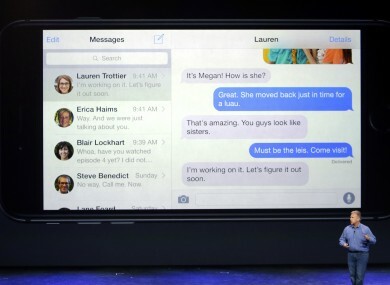 Feedback on “Could Apple's iMessage be making its way to Android?”.